The E-180-H Nozzles is large Industrial Nozzles in which the orifice flow is varied by by-passing or “bleeding” liquid from the Nozzle swirl chamber while the line pressure to the Nozzle remains constant. Capacity is varied between maximum and minimum by controlling the by-pass line pressure, and excellent firing results are obtained with turn-down ratios of 3 to 4 to 1. The capacity and spray angle ratings are based on operating at 300 PSIG line pressure on 100 SSU operating viscosity oil with the by-pass line closed. Spray angles available are 40°, 50°, 60° and 80° and it should be noted that spray angles increase from 5° to 10° when the by-pass line is wide open. These Nozzles may be used on No. 2 fuel oil, but capacities and spray angles will be approximately 10% less than on 100 SSU oil. Oil of 100 SSU operating viscosity is typically obtained by preheating U.S. No.6 fuel oil to 175°F to 265°F with a norm of about 240°F. Accompanying charts show flow through the orifice when the bypass pressures are at various points from open to closed. Note that the total flow to the Nozzle (when the by-pass line is wide open) can be almost 50% greater than the nominal capacity of the Nozzle and this must be taken into account when sizing pumps. Pressure-flow curves can be supplied for any specific capacity size, on request. Nozzles are made of cold rolled steel, with tips and discs case hardened and individually lapped together as mated sets. Complete E-180-H Nozzles have a net weight of approximately 18-1/2 ounces. The tip and disc set have a net weight of approximately 2 ounces. The Fig. D-41 direct pressure operated Industrial Oil Nozzle will spray oils having an operating viscosity as high as 100 SSU with liquid pressure of 200-250 psi., depending upon the capacity size—the smaller the capacity, the higher the pressure required. Will handle Bunker”C” oil if heated to about 180° to 200° with 200 psi pressure. Tips and Discs are case hardened and lapped for proper seating and should not be transposed. Each matched Tip and Disc combination is identified by a letter stamped on each part so the customer can always determine mating parts. Nozzles are always rated and stamped for capacity on No. 2 fuel oil at 100 psi. If order so specifies (and at a nominal extra charge), nozzles can be tested for spray angle and spray quality on either No. 2 or 100 SSU operating viscosity oil at pressures of either 200, 250 or 300 psi. * Flow rates in the table are based on No. 2 fuel oil of 34 SSU viscosity at 100°F. On 100 SSU viscosity oil, flow rates will increase about 10% over No. 2 oil rating. *When so tested, the spray angle test pressure is stamped on the nozzles. If tested on 100 SSU oil, the nozzles are stamped “D-41-HO”. Specify Quantity, Capacity Size, Pipe Size Connection (1/2″ or 3/4″ NPT), Spray Angle desired (Can be furnished in 10° steps from minimums shown in chart to 100° maximum), Operating Pressure available and whether to be tested on No. 2 oil or 100 SSU oil. If not otherwise specified, nozzles will be tested only on No. 2 oil at 100 psi. Monarch offers a superior line of nozzles including the C-202 Air Operated Nozzle. This series is widely used on industrial burners using up to 50 psi air pressure for atomization. The C-202 nozzle is recommended for large capacity industrial applications such as airports, manufacturing facilities, universities and military applications. For excellent firing results, use the C-202 in combination with high velocity combustion air. C-202 nozzles are made of cold rolled steel and are precisely machined to combine air and oil into a common swirl chamber through separate openings to properly proportion the two. This results in the oil being discharged in exceptionally find spray ready for burning. Flow ratings in the table are based on No. 2 fuel oil, but heavy oils can be handled satisfactorily provided they are preheated to bring the viscosity down to about 150 SSU. Flow rates shown are determined by air and oil pressured and turndown ratios between 3 and 4 to 1 can be obtained by reducing air pressure to as low as 5 psi, keeping oil pressure always at least 2 psi higher than the air. Best atomization is obtained by regulating the air pressure. Some manufacturers operate at 15 psi constant air pressure and vary only the oil pressure for different flow rates and others modulate both air and oil pressures for maximum turn-down. Minimum air requirement depends on oil pressures used, as any particular flow rate can be produced by an infinite number of different air-oil pressure combinations. Curve charts showing oil flow rates and air consumption at different air and oil pressures are available upon request for each size nozzle. 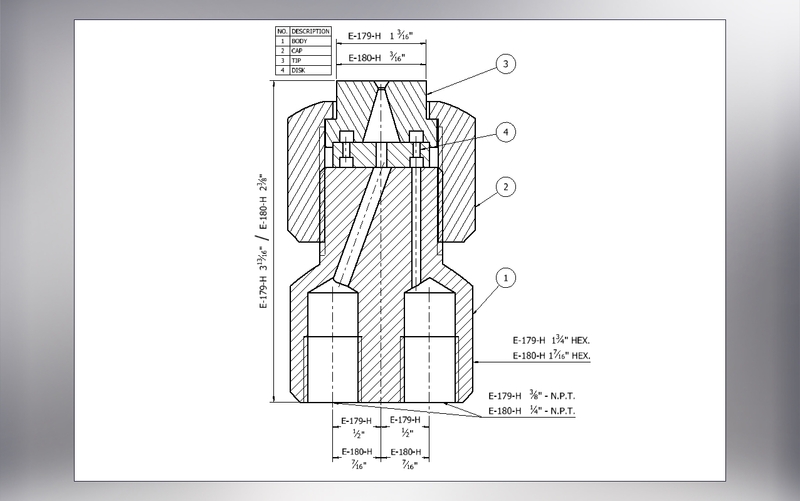 The C-202 nozzles comes with angles of 60° or 80° spray angle but other specifications are available for custom. NOTE: Oil pressure must be at least 2 PSI higher than air pressure. Refer to burner manufacturer’s instructions. The C-169-WA and C-170-WA nozzles are widely used on Industrial Burners using up to 21 psi air pressure for atomization, and oil pressure at least 2 psi higher (depending on oil flow rate desired). Excellent firing results can be obtained when these nozzles are used in combination with high velocity combustion air through properly designed Air Mixing Equipment to give the flame a rapid whirling motion. Air and oil are fed into a common swirl chamber through separate openings to properly proportion the two, resulting in the oil being discharged in exceptionally fine spray ready for burning. Flow ratings in the table are on No. 2 fuel oil, but heavy oils can be handled satisfactorily provided they are preheated to bring the viscosity down to about 100 SSU. Flow rates shown are approximate maximums, and turndown ratios between 3 and 4 to 1 can be obtained by reducing air pressure to as low as 5 psi, keeping oil pressure always at least 2 psi higher than the air. Best atomization is obtained with oil pressure 8 to 10 psi over the air pressure. Some Manufacturers operate at 15 psi constant air pressure and vary only the oil pressure for different flow rates and others modulate both air and oil pressures for maximum turn-down. Air requirements depend on air and oil pressures used, as any particular flow rate can be produced by an infinite number of different air-oil pressure combinations. Curve charts showing oil flow rates and air consumption at different air and oil pressures are available upon request for each size nozzle. C-169-WA and C-170-WA nozzles are made of cold rolled steel and can be supplied with spray angles from 50° to 100° in 10° steps. 80° spray angle is considered the standard and will be furnished unless ordered otherwise. Weight: C-170-WA 1.2 lbs. ; C-169-WA 2.0 lbs. Ordering: Specify quantity, figure number, capacity size and spray angle. Note: Oil pressure must be at least 2 PSI higher than air pressure. Refer to burner manufacturer’s instructions. Preheating is recommended for higher viscosity oils. - spray angle - letters to identify the series of spray patterns - the reference MTD-92 - the MONARCH trade mark. Each MONARCH MTD-92 nozzle is individually tested at several different production stages to assure perfect conformity with master nozzles of each series. The spray patterns (i.e. hollowcone or solid cone) described below refer to the tests carried out with a 60° angle at a75 mm distance from the nozzle orifice. In nozzles of a 60° spray angle or less, and forlow flows in particular, the empty section of a hollow cone becomes smaller. The difference between hollow cone and solid cone practically disappears.